A Defibrillator (often referred to as an AED, defibrillator or Defib for short) is a computerised medical device which delivers an electrical current through the chest which aims to shock the heart back into a normal rhythm allowing it to pump again. Defibrillators can automatically detect the heart's rhythm and can determine, without intervention by an operator, whether it is a case of cardiac arrest and whether defibrillation (an electrical shock to the heart) should be performed. The speedy use of this automated technology can significantly improve the quality of life of a survivor, as the longer the brain is starved of oxygen, the more the damage that can occur. 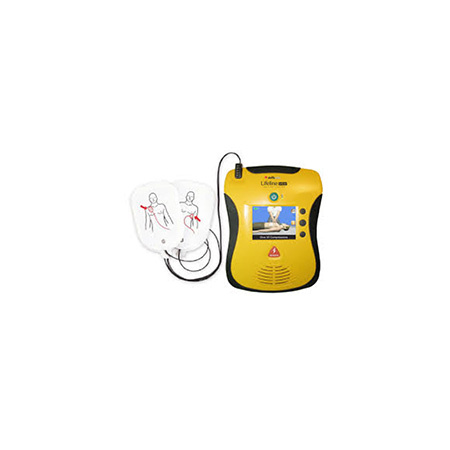 This type of portable lightweight defibrillator is called an automated external defibrillator (AED). A member of the public does not need to be trained to use an AED as from the moment an AED is switched on the user is given exact instructions by the machine on what to do next. The use of an electric shock is fully automated. The shock is only administered if the AED has identified a life-threatening heart rhythm which requires treatment with an electric shock. The user cannot do any harm with the AED. AEDs are available in lots of community settings – busy locations, such as shopping centres and airports; sports clubs, where there is a potentially greater incidence of cardiac risk in the young; community settings such as churches and community halls and remote villages where it may take a longer than usual time to for an Ambulance response. WHY IS EARLY DEFIBRILLATION NEEDED? 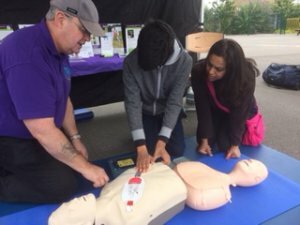 When someone goes into cardiac arrest, every minute without Cardio Pulmonary Resuscitation (CPR) and defibrillation reduces their chances of survival by 10%. How is a Public Access Defibrillator activated? In all cases dial 999 (or 112) first. It is really important the professionals are on their way. The ambulance service knows where all PADs are located. The Ambulance Call Handler will notify you if there is a PAD box near to you and, if it is easily accessible, give you the access code to open the box. You or someone else should immediately fetch the Defibrillator, but do not leave the patient alone and without anyone administering CPR. Immediately the Defibrillator is brought to the patient switch it on and carry out the instructions on the voice prompt. Continue with CPR and defibrillation as directed by the AED voice prompts until professional help arrives. Is provided on some AED / Cabinet Manufacturer web sites. The Community Heartbeat Trust also includes information on its web site.